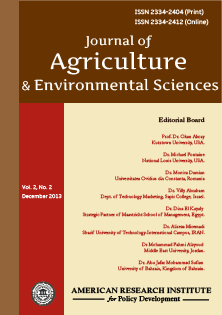 Each paper published in Journal of Agriculture and Environmental Sciences is assigned a DOI®number, which appears beneath the author's affiliation in the published paper. Click HERE to know what is DOI (Digital Object Identifier)? Click HERE to retrieve Digital Object Identifiers (DOIs) for journal articles, books, and chapters. CrossRef, CrossCheck, Cabell's, Ulrich's, Griffith Research Online, Google Scholar, Education.edu, Informatics, AGRIS, Biosis Biological Abstract, ProQuest Agriculture Journal, HINARI, Universe Digital Library, Standard Periodical Directory, Gale, Open J-Gate, EBSCO, Journal Seek, DRJI, BASE, InfoBase Index, OCLC, IBSS, Scientific Index, Academic Journal Databases. Dr. Ismatul Hidayah, Ministry of Agriculture, Indonesian Agency for Agricultural Research and Development (IAARD). Dr. Vatcharee Seechamnanturakit, Faculty of Agro-Industry, Prince of Songkla University, Thailand. Dai Lizhu, Dept. of Geography, Hong Kong Baptist University, China. Isara Chaorakam, PhD., National Agricultural Machinery Center, Kasetsart University, Thailand. Dr. Joseph Kariuki Muriithi, Dept. of Environmental Studies and Community Development, Kenyatta University, Kenya. Dr. Martin Kajokare Loboka, Department of Environmental Studies, University of Juba, Sudan. Imene Kaddachi, Dept. of Microbiology, University of sciences of Tunis, Tunisia. Mr. Mark Matsa, Dept. of Geography and Environmental Studies, Midlands State University, Zimbabwe. Obiefuna J. Nwabueze, Dept. of Geography and Environmental Science, University of Calabar, Nigeria.